What should you wear for all those multiple wedding events if you are the bride's sister, cousin or close buddy? We have all the answers in Utsav Trends. Be exciting. Be sassy. Be flirty. Be beautiful. Just slip into a sheer fabric, show off those slits, get selfie-ready in pastels or jewel tones, Set hearts a-flutter! Take a look here, girls before the world looks at you in a new light. The trick is to avoid going over the top. Plain Georgette, Crepe or Silk Sarees in electric hues with striking embellished borders are seriously mind numbing. There's Ombre too - a vivacious colorful trend in drapes. Get a super-stylish Embroidered Blouse and a statement jewelry piece. Can you handle the attention? Giving the blushing bride a love-all party? Match your attire with the tint on her cheeks - Pastels and Candy hues are such a break from rich, dramatic colors that will flood the events, Wispy Chiffons and Georgettes in Milky White, Baby Blue, Piggy Pink & Misty Rose will give you the perfect selfies. How sweet is that! As the champagne pops, make a sensuous statement in our finest options in sheer Net fabric. 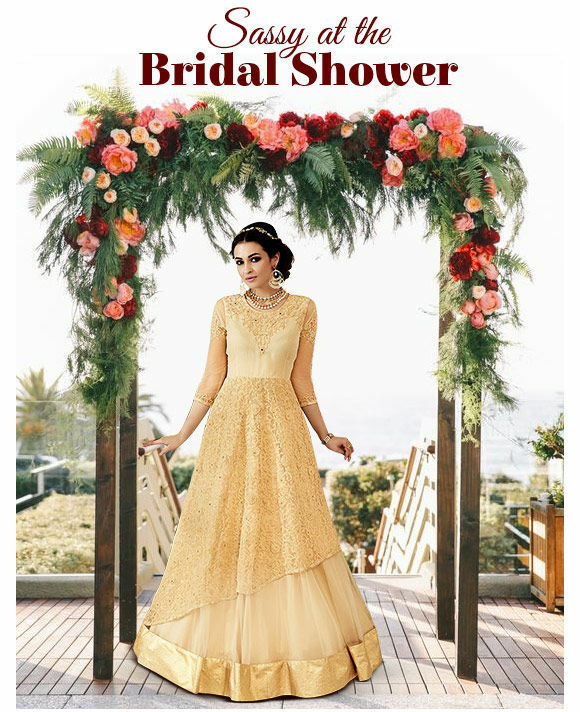 You'll love the hint of mischief in Net Lehenga cholis, Sarees and Gowns. Also explore some fancy attires with Front Slits, especially the Abaya styles and Pakistani Suits with Cigarette Pants. Oolala! Song and dance, lots of laughs, shimmer and color - got these ingredients in hand? Just step in to shop for our Metallic-hued stunners dipped in Silver Grey, Golden Beige, Shimmering Green and Twinkling Blue. Or ditch the metallic route for Color Blocked ensembles that set people talking. Now's the time to tweak tradition and turn to the West for inspiration. With trails being a major fashion trend, go for flared Abaya style Suits that are nice and feminine, with lots of Zari and Resham work. Another sure showstopper is the Jacket style Lehenga Choli with its elegant sleeves. Monalisa, smile!